I make stuff on scratch. Lots of coding. I appreciate everyone's code I use in my projects. I mostly make games for fun, but if you enjoy them, that is even better. Спасибо за чтение и перевод текста. Projects and stuff I wanted to make. 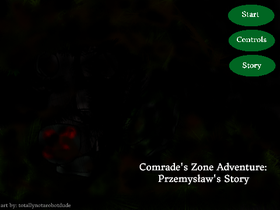 Working on Comrade's Zone Adventure: Przemyslaw's Story fixes and other new content. Maybe working on a new Comrade's Zone Adventure game, most likely it'll be 2D.